I hope you all had a wonderful weekend! The weather here was glorious, so I decided to give social media a little break and just soak up all of the Fall-ish weather, snuggles with my boys (and Ruby! ), and drink all pumpkin spice lattes. I've had a lot of requests for this post so I'm just going to dive right in! As I was writing this post I just kept thinking, damn if only I ate as healthy as Rowan! Ha. And if you're not looking for baby stuff, don't worry I'm haven't gone 100% mommy blog on you. We opted to feed Rowan purees over the Baby Led Weaning approach for a few reasons. 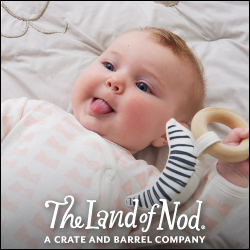 Our Ped did not recommend finger foods at all (even if they are soft starter foods - you should have seen the face he made when I mentioned this) until 8-9 months because the risk of choking is too high. I'm a worrier to that was basically all I needed to hear. But the mess and time involved with BLW confirmed it for me. I'm sure it works well for other families, but it's just not for us. Always check with your Pediatrician first! Rowan has been doing so well with purees, chewing and demanding more after eat bite, so I'm really glad we went this route! It takes me about and hour on a Sunday afternoon to do a couple batches of homemade purees for Rowan. I stick to making about 2-3 purees at a time and I do it while I'm prepping our own dinner. Generally he has about 5-6 different purees in the freezer and I make them once a week, or every two weeks if I was ambitious with my last batch. We do still buy a few all natural purees or pouches because they are easy to grab and go if we're planning to feed Rowan while we are out of the house or traveling. Ninja Blender. Ice Cube Tray with lid. Steamer insert. For basics and how to make each puree, I always consult Wholesome Baby Foods. Also I buy organic whenever I can. At night I put cubes for the next day in small containers in the fridge. I serve the fruits cold, and warm the veggies in the microwave for about 10-15 seconds. Make sure you test it to make sure its not too hot! Thinning: At first I thinned his food with breastmilk before serving, rather than prior to freezing. I still do thin some of the thicker purees with breastmilk but more often I just add water while blending the puree. Easiest purees vs. hardest: Bananas and avocados don't need to be steamed, just mash them up with a fork! The hardest purees for me to make so far have been green beans and peas. They don't come out really smooth because of the skins, but Rowan doesn't seem to mind. Now we feed him purees three times a day, about an hour after he nurses. Favorites: Basically any fruit, especially pears, bananas and blueberries. Sweet potatoes. Green Beans. His new favorite combo is sweet potatoes, apples, pumpkin and some cinnamon. Tolerates: Avocados and Carrots as long as they are mixed with his favorite fruits. Hates: Butternut squash! The kid will gag and give me the most hilarious, angry face. I don't blame him though, that one isn't a hit with his parents either. So I know this may seem like a lot of effort, but even as a working mama I still enjoy making his food and I think it's worth it! It saves so much money and I know exactly what is going into his food. Feel free to ask if you have questions! Saving this for later. I've been really interested in BLW and this route, so thanks for sharing! This is what I've always done as well and plan to do with #3. I often add spices when serving to introduce flavors so maybe if you tried some cinnamon or Rosemary on the squash? 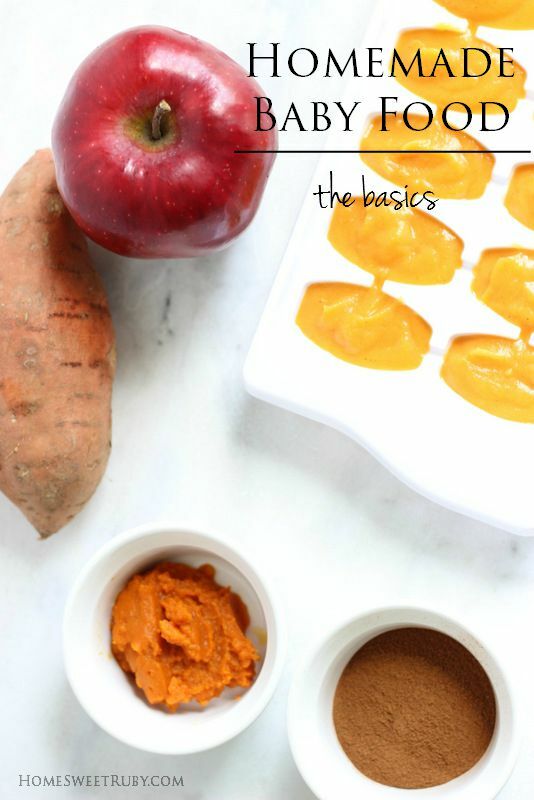 I've been making baby food as well and was surprised by how quickly you can actually make it! It takes no time, especially when you do it as you are preparing something else in the kitchen. You're so good! I lasted about two months into this process (and actually enjoyed it!) but then David had his leg injury and this was the last thing on my list! Great post! I like that you use a normal blender and not one of those baby ones. Is it weird I'm really looking forward to making my own baby food?! I'm sure I won't be saying that once the time really comes! And I still can't believe R doesn't like butternut squash! It's so sweet once it's roasted! Those ice cube portions are such a good idea! One of my girlfriends does this and it's genius!